It's their year end blowout sale! 70% OFF select styles at Please Mum, and FREE SHIPPING too, on any purchase! A great time to buy and stock up at these prices - starting at $4.99 for tops (long sleeve!) and bottoms (fleece ones too!). I've purchased online many times from Please Mum, I love the quality of their clothing. With their free shipping offer, which they've had ongoing for a long time, it's also a great place to buy gifts and have them shipped directly to the recipient! Shop this deal at www.PleaseMum.com. 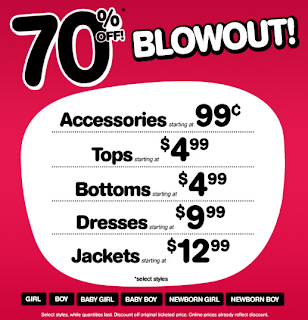 1 Response to "Please Mum 70% Off Blowout Sale"